Evidence suggests additional investments in agriculture could increase income for subsistence farmers, potentially improving the livelihoods of millions of people. In rural Mali, giving some farmers unrestricted cash grants led to significantly higher productivity and profits, suggesting farmers would invest more in their farms if they had more capital. Providing farmers with an innovative loan product also led to a significant increase in farm investments and expenditures, suggesting agricultural loans tailored to farmers’ seasonal cash flow may be an effective way to increase investments in agriculture. In addition, this research suggests farmers vary in the returns they are able to generate from inputs, and agricultural loans attract clients with a better-than-average ability to grow their farms. Agricultural productivity in Africa is very low despite the existence of modern agricultural inputs such as improved seeds, fertilizers, and pesticides. As a much of the population works in agriculture, encouraging the adoption of these technologies could raise agricultural productivity and in turn reduce poverty and encourage economic growth. But why do farmers fail to invest in these potentially profitable inputs? One reason may be that they do not have enough cash on hand when they need to purchase inputs and they lack access to credit. Microcredit organizations have attempted to address this problem, but the typical microcredit loan contract—where clients must start repayment after a few weeks—is ill-suited for agriculture. Providing farmers with loans at the beginning of the planting season, to be repaid in a lump sum at the time of harvest, could facilitate investment in inputs and increased profitability. However, there is little evidence on this type of microcredit. In Mali, 80 percent of people work in agriculture, most of them in subsistence farming. The sector accounts for about 37 percent of Gross National Product.1 This study takes place in the region of Sikasso, within the areas of Bougouni and Yanfolila, in southern Mali. In these areas, farmers grow cash crops like cotton, maize, sorghum, millet, and groundnuts. Soro Yiriwaso, is a microfinance institution in Mali whose mission is to increase economic opportunities for poor Malians, especially women, by offering financial services. Soro Yiriwaso offers a loan product called Prêt de Campagne, or “countryside loan,” to women who join local community associations. Unlike most microloan products, it is designed specifically for farmers. The loans are dispersed at the beginning of the agricultural cycle between May and July and clients must repay loans on one lump sum immediately after the harvest. Soro Yiriwaso issues the loan to groups of women organized into village associations. Each individual woman then establishes a contract with the association for her loan. 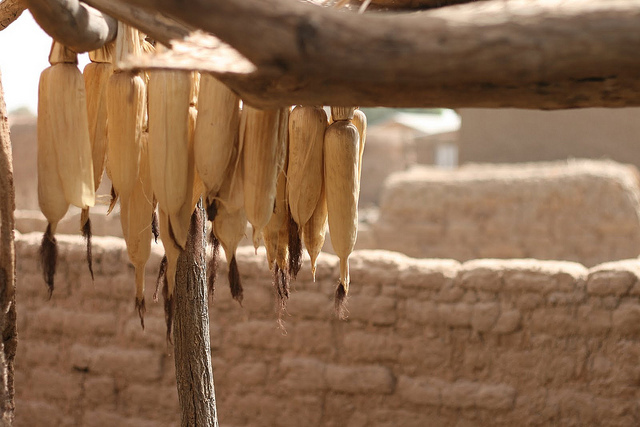 To evaluate the impact of the Prêt de Campagne loan product on agricultural productivity and farm profits, researchers partnered with Soro Yiriwaso to conduct a two-stage randomized evaluation in 198 villages in rural Mali. In the first stage of the study, Soro Yiriwaso offered their standard agricultural loan in 88 randomly selected villages. In these villages, only women who joined a local community association were eligible to receive loans. In the remaining 110 villages, no loans were offered. In a second stage of the study, researchers offered grants in the 88 loan villages to a random subset of the households who chose not to take out loans. The grants were worth 40,000 FCFA (US$140)— about the size of the average loan provided by Soro Yiriwaso and equivalent to around 70 percent of what average households spent on agricultural inputs. In the 110 villages where no loans were offered, households were also randomly selected to receive the grants. Similar to the loans, these grants were issued directly to a female household member. Over a two-year period, researchers measured changes in farmers’ cultivated area, input use, and production output. They also collected data on food and non-food expenses of the household as well as on financial activities (formal and informal loans and savings) and livestock holdings. Take-up and Use of Loans: About 22 percent of the women chose to accept the loan in treatment villages, which is a take-up rate similar to other microcredit products. Households offered loans increased investments and expenditures on agricultural inputs. Households in villages which were offered loans spent on average US$10.35 more on fertilizer and US$5.08 more insecticides and herbicides than the households in villages that did not get loans. Offering loans led to an increase in the value of agricultural output by US$32, and an increase in the value of livestock by US$168. The loans did not have a significant effect on profits, consumption, whether the household has a small business, nor educational expenses. The return to agricultural investment varied across farmers, with more productive farmers generating higher returns to agricultural inputs. Grants: In villages where loans were not offered, providing grants to women in households led to an increase in agricultural investments and, ultimately, profits. Households randomly selected to receive grants cultivated 8 percent more land and invested 14 percent more on inputs than households that did not receive grants. Output and farm profits among women who received grants also increased 13 percent and 12 percent, respectively. Self-Selection: Productive farmers—households that invested more in agriculture, had above-average agricultural output and profits, or had more agricultural assets and livestock than average before the program—were more likely to borrow and generated higher returns to their investments. Moreover, in the villages where loans were offered, households who opted not to take out a loan and instead received a grant did not generate the same returns as those in no-loan villages who were offered grants. This suggests that households that applied for loans were those with the high returns to capital. Retention and repayment: The repayment rate among women who elected to take out loans was perfect and 50 percent of clients chose to borrow money again, which is on par with typical client retention rates for sustainable, entrepreneurially focused microcredit operations. Overall, this research suggests that agricultural lending tailored to the farmers’ seasonal cash flow may be an effective way to increase investments in agriculture and improve yields and profits. Furthermore, the evidence that productive farmers are more likely both to apply for agricultural loans and to generate higher returns on the agricultural investments they make has important implications for credit markets. Farmers vary in the returns they are able to generate from inputs, and agricultural loans attract clients with a better-than-average ability to grow their farms. Beaman, Lori, Dean Karlan, Bram Thuysbaert, and Christopher Udry. “Self-Selection into Credit Markets: Evidence from Agriculture in Mali.” Working Paper, May 2015. 1 International Fund for Agricultural Development (IFAD). “Mali Statistics.” Rural Poverty Portal. < http://www.ruralpovertyportal.org/country/statistics/tags/mali>. Accessed: 4 March 2015. International Fund for Agricultural Development (IFAD). “Enabling the rural poor to overcome poverty in Mali.” http://www.ifad.org/operations/projects/regions/Pa/factsheets/mali_e.pdf. Accesed 4 March 2015. Pg 2.